Kesha’s recent album “Rainbow” speaks about evolving and growing stronger. A message of HOPE after trauma. Her new campaign #PrayingForAChange uses her social media platforms to bring attention and awareness to non-profits to make a change in the world together. Many of us struggle with the emotional aftermath of a tragedy. Whether it is losing someone, surviving a horrific tragedy or disaster, being abused, losing your home, or any of the many tragic events that may occur in one’s life. Many of the emotions that attack us are the same. 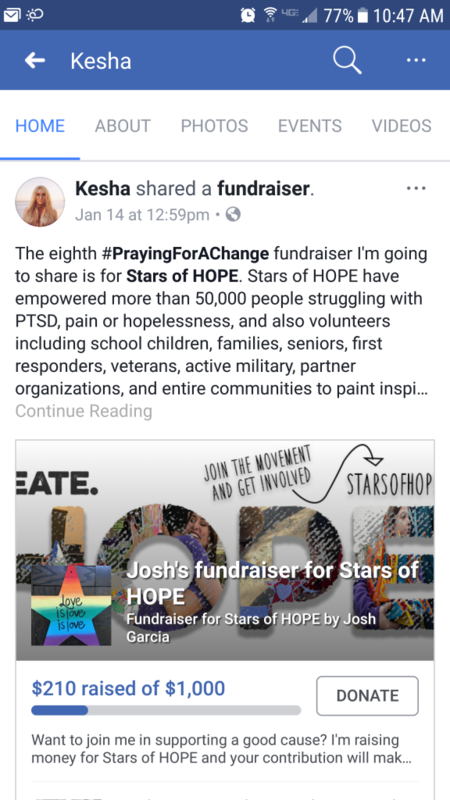 Feeling alone and feeling guilty to the extent of telling everyone you are ok.
Stars of HOPE® is honored to be selected by Kesha and her team, knowing through music Kesha is creating hope. Her commitment to empowering others through her lyrics continues to heal by telling her story of trauma and resiliency. Giving others hope and aligning with the Stars of Hope vision to turn tragedy into hope. Together we heal, and together we can make a change to turn our hopes into reality. As a past employee of the Pulse Orlando nightclub, Kesha’s album not only encourages me to move forward but helped to realize we all have the power to make a change just as Stars of HOPE did for me in August of 2016. Like Kesha’s lyrics, these simple Stars of HOPE reminded me of the “light” and “colors of the rainbow” that keep our world bright. Strangers who inspire hope to others in need of that reminder. I hope to bring more awareness to Kesha’s #PrayingForAChange campaign to inspire others by her efforts.